Sharing is Caring! You may not be an active member of the Salvation Army, but there are times when you would want to share an exciting entertainment experience with friends and family. It might be a music or video while on a commute/flight, or sounds from a game during a group gaming session with your buddies. At these times, two things are important. The ability to share effortlessly (ease of use) and not losing sound quality while sharing (performance). 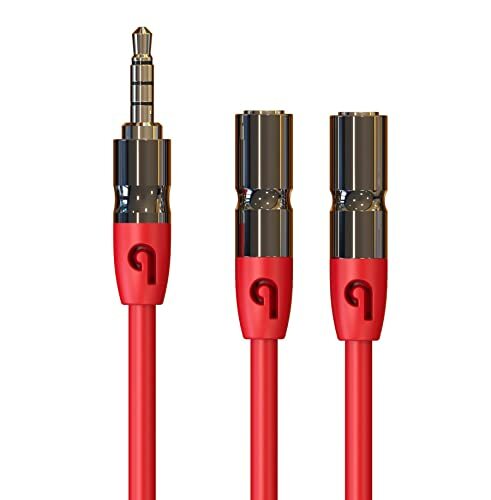 Before, we head onto our selection of the best headphone splitters currently available, we should take a minute to expound on the major considerations that should guide your decision when making a headphone splitter purchase. Number of Ports. From the outset, this consideration does not sound complex. More is better. However, having many ports (more than two ports) comes with a caveat—decrease in sound quality. Thankfully, of recent, manufacturers have made advances in product technology to make this less of a problem. Top-quality headphone splitters now feature individual volume control for each port and other proprietary solutions, so that everyone connected to the splitter have roughly the same experience..
Plug Plating: Gold vs. Silver vs. Nickel. On paper, gold conducts electricity better than silver and nickel. The fact is, on the average devices and in real-world usage, you would not be able to tell the difference between the sound quality of a gold-plated plug and plugs plated with silver and nickel. Therefore, you should not let the marketing hype get to you. If your final decision rests on plug plating, it is safe to go with the more affordable model. Secure Fit. You do not want a sorry situation where connections are routinely cut off because headphone plugs do not fit securely to the jacks of the splitter. This mars the experience of using a splitter and you should avoid it by ensuring that connections fit snugly. The Belkin FBZ274btBLU Rockstar design and performance stays true to its Rockstar name. It sports a simple but aesthetic design and offers high-level performance at an affordable price point. With the Rockstar, you are able to make one hard-wired connection to any type of media device with an audio jack—smartphones, tablets, PCs, mp3 players, portable DVD players, et cetera. 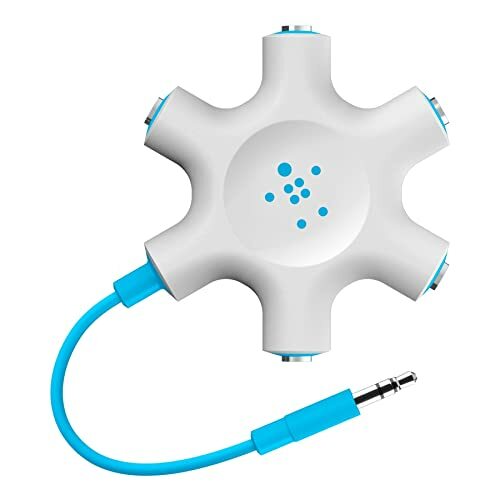 The device then offers five (5) jacks to which you can connect headphones and speakers. The large number of jacks offered does not impinge on sound quality of sound playing out through any of the jacks. The sound quality remains roughly the same for each listener using the Belkin Rockstar, regardless of the number of jacks connected. Therefore, whether you want to enjoy a video with a buddy or with your kids, everyone would experience excellent sound quality. This feature earns the Belkin Rockstar the top spot on our list. If a device has an audio jack that would be a fit for a 3.5mm plug, then it would work with the PlugLug PL11073. The design of the PlugLug is basic with thick cables, polished metal molding, and gold-plated plugs that are corrosion resistant. In addition to making it the lightest splitter on this list with a weight of only 0.3 ounces, the design also enhances the durability of the splitter. Furthermore, thanks to a beveled step down design of the plugs, the splitter is able to offer one of the most secure fit you would ever get with a splitter. You would be able to connect the Plug Lug PL11073 to two headphones with the sound quality remaining unchanged for both lines connected. The iLuv iCB107 features a stylish design with a durable build. 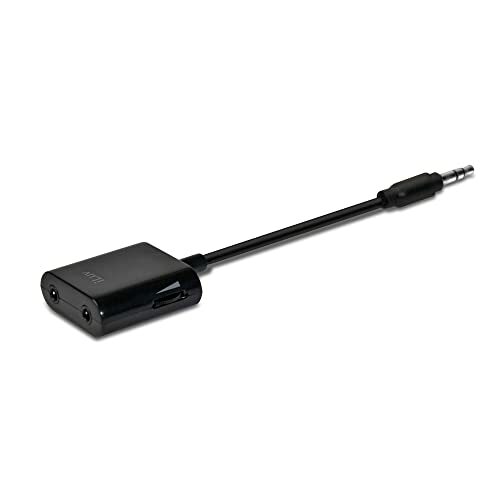 You are able to connect the splitter to virtually any media device with a standard 3.5mm audio jack. Furthermore, it allows you to connect easily to five headphones, which is great when you have to share connections to many people. The performance of the iCB107 is decent enough for most scenarios. The sound quality is not noticeably affected, even if all five ports are connected at the same time.